"Walk right to school, and don't walk on anybody's lawn, because they don't want you there anyway," Frederick Brewington, who is black, recalled his mother saying before he left for school on Feb. 23, 1966, the day the court-ordered desegregation of the Malverne School District officially took effect. 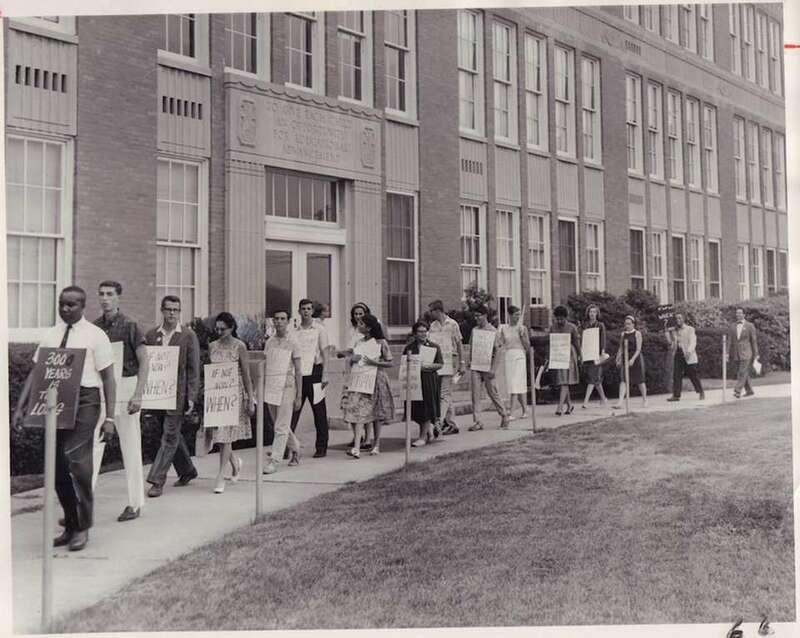 While you're probably familiar with Brown vs. the Board of Education of Topeka — the 1954 Supreme Court decision that declared state laws establishing separate public schools for blacks and whites to be unconstitutional — you may not know about the civil rights battles that played out inside Long Island's schools. Through protests and pickets, local parents and activists fought to make education a level playing field. As we observe Black History Month, let's take a look back, using Newsday's archives, at some of the biggest moments in the fight to desegregate Long Island's schools. 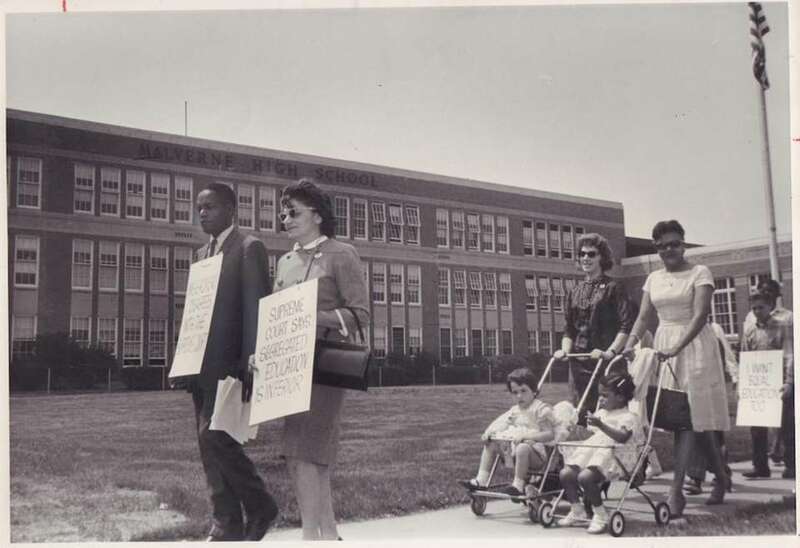 On May 17, 1962, about 100 adults and children -- led by Lincoln Lynch, left, Long Island chair of the Congress of Racial Equality (CORE) -- picketed outside Malverne Junior High School. Protesters pushed for desegregation of the Malverne School District, composed of about half the Village of Malverne, part of the neighboring hamlet, Lakeview, and a portion of Lynbrook village. The student body at Woodfield Road School in Lakeview was about 75 percent black while the district's other elementary schools, Lindner Place in Malverne and Davison Avenue in Lynbrook, were about 14 percent black, according to Newsday reports at the time. 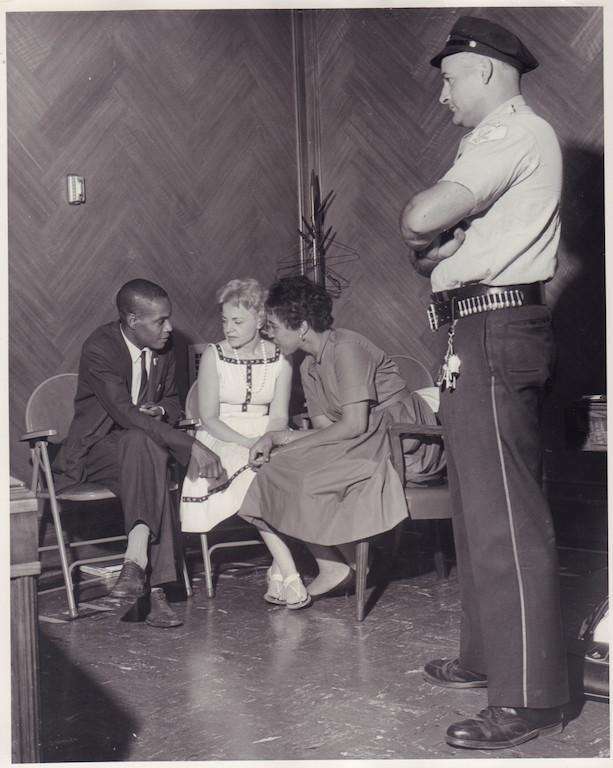 LI CORE chair Lincoln Lynch, left, fasted and sat with two other parents for 24 hours in the Malverne High School administrative office on Aug. 2, 1962, urging the school board to take notice of how segregated the schools were. That September, the Lakeview NAACP accused the Malverne district of segregating the schools through gerrymandering. The NAACP also complained of poorer quality education in the largely black Woodfield Road School. Following this action, state Education Commissioner James Allen ordered in June 1963 that a "Princeton Plan" be implemented in the Malverne School District. The plan would send children in kindergarten through third grade to Lindner Place and Davison Avenue schools, and children in fourth and fifth grade to Woodfield Road, rather than send them to the schools in their neighborhoods. In this 1963 photo, teacher Helen Mullen stands before her second-grade class at Woodfield Road Elementary School. The order was met with resistance and demonstrations. 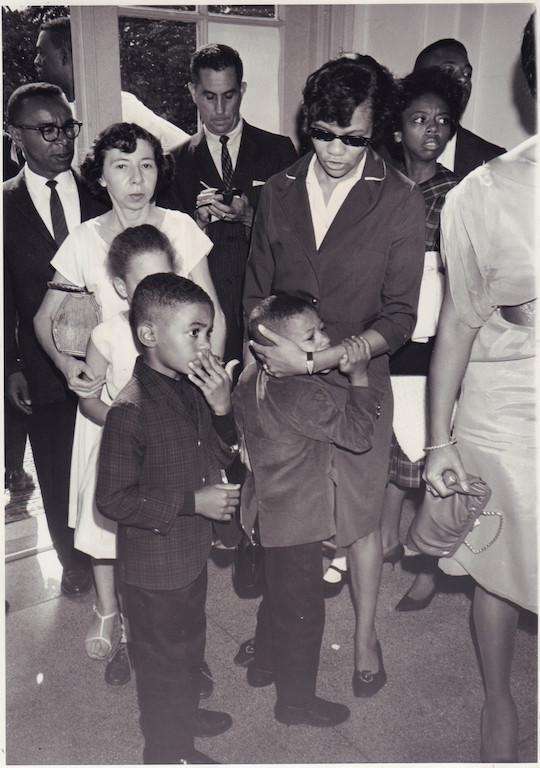 School officials tried closing the doors to prevent the students from hearing the demonstrators, and during a scuffle on Sept. 4, 1963, a young boy burst into tears. Parents and the school board challenged Allen's plan in state court, delaying its implementation. Some white parents who opposed the plan formed the Taxpayers and Parents Association, which wanted to keep the neighborhood school system intact. Anne Wells, 80, a former vice president of the Lakeview chapter of the NAACP, had a daughter in elementary school during the 1960s. She said the resistance to Allen's desegregation order was rooted in racism. "It was a stigma at that time," she said in a recent interview. "Parents didn't want their children to mix with the Lakeview kids. That in essence was part of the problem." When the state education commissioner issued his desegregation order to Malverne in 1963, he also announced that all New York school districts should push to end segregation in schools. 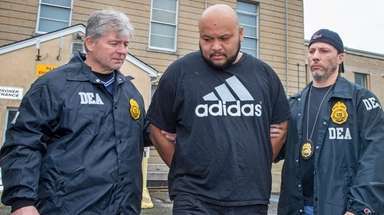 Thus, other districts began to look to Malverne as a test case, according to Newsday reports at the time. The debate played out in Amityville, where the Northeast Elementary School was being built. Eugene Burnett, now 87, was the Amityville NAACP's secretary at the time. He said the NAACP knew the North Amityville school would be segregated because it was going to be built in a largely black neighborhood. But Allen had approved the school. 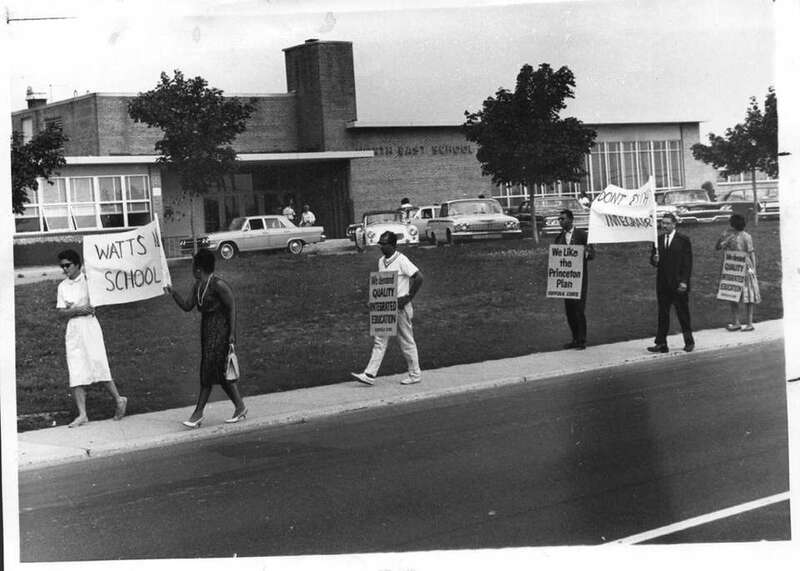 The NAACP sued in 1962, and residents picketed in front of the Northeast School on Sept. 8, 1965, pictured above. Three months later, Allen ordered Amityville to come up with a plan to desegregate the schools. The school district decided to place kindergarten students in the Northeast school and split first- through fifth-grade students between the Northwest and Park Avenue schools, depending on where the students lived. In Malverne, the Taxpayers and Parents Association sued the village, the school board and the state education commissioner to stop the Princeton Plan from being implemented. In 1964, the State Supreme Court ruled against Allen's order, but that decision was overturned a year later when the State Court of Appeals ruled the commissioner had the authority to enforce his plan, even if it was opposed by the school board. In 1965, the case was appealed to the U.S. Supreme Court, which upheld the appellate ruling. 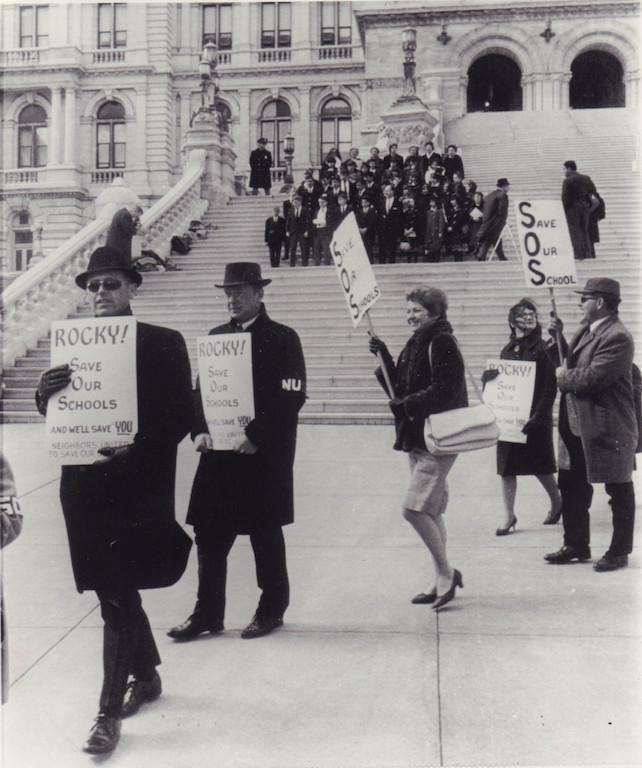 Pictured above, parents and teachers from Long Island and other New York communities picketed in Albany in 1966, supporting a bill barring any order for school desegregation through busing. 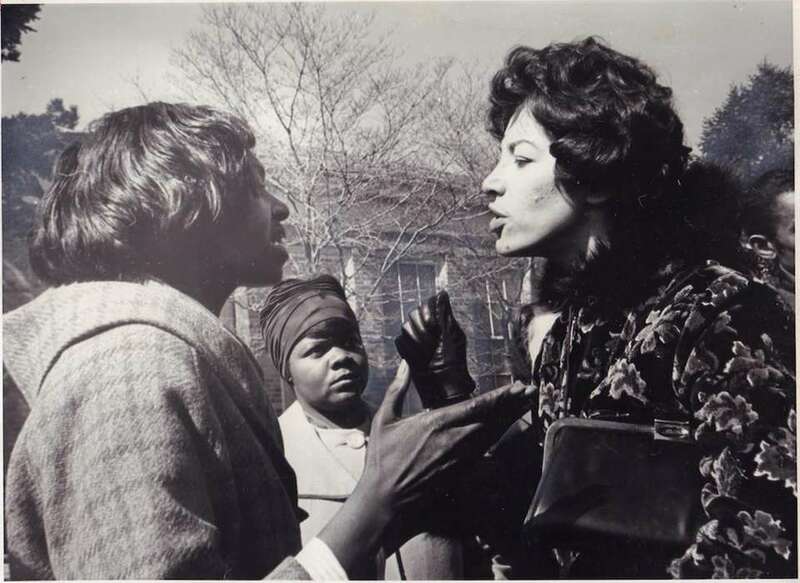 On Feb. 23, 1966, the day the court-ordered desegregation officially took effect in the Malverne School District, parents, pictured above, were seen arguing while dropping off their children at Lindner Place Elementary School. 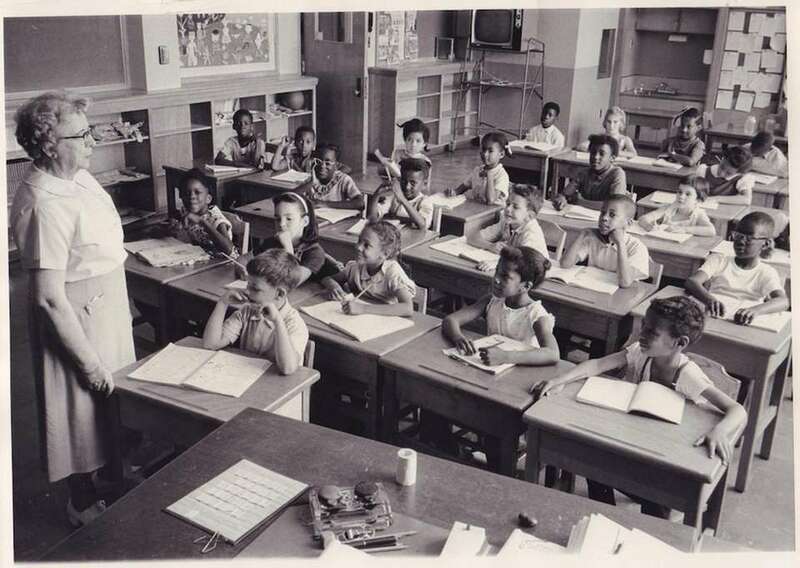 Although Malverne was the first New York school given a desegregation order by the state education commissioner, by the time the U.S. Supreme Court affirmed the order, the Manhasset and Westbury school districts had already complied with desegregation orders. Frederick Brewington, now a civil rights lawyer in Hempstead, was one of the first black children affected by the desegregation order in Malverne. On that first day, reporters there asked him what his mother told him before going to school. "She said to walk right to school, and don't walk on anybody's lawn, because they don't want you there, anyway," he said in a 2016 interview. Looking back, Brewington said he thought the desegregation was successful among the kids. 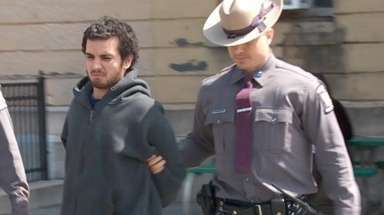 "They were not looking at each other as anything other than classmates," he said. 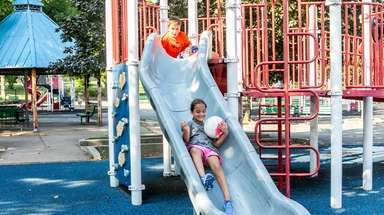 Photo Credit: Newsday / John H. Cornell Jr.
A significant portion of the Malverne village population has historically attended private schools. James Hunderfund, now the district's superintendent, said more than a quarter of the eligible student population in the Malverne school district currently attends private school. The Taxpayers and Parents group in Malverne, which opposed the Princeton Plan, argued that white parents would send their children to private schools in response to school desegregation. 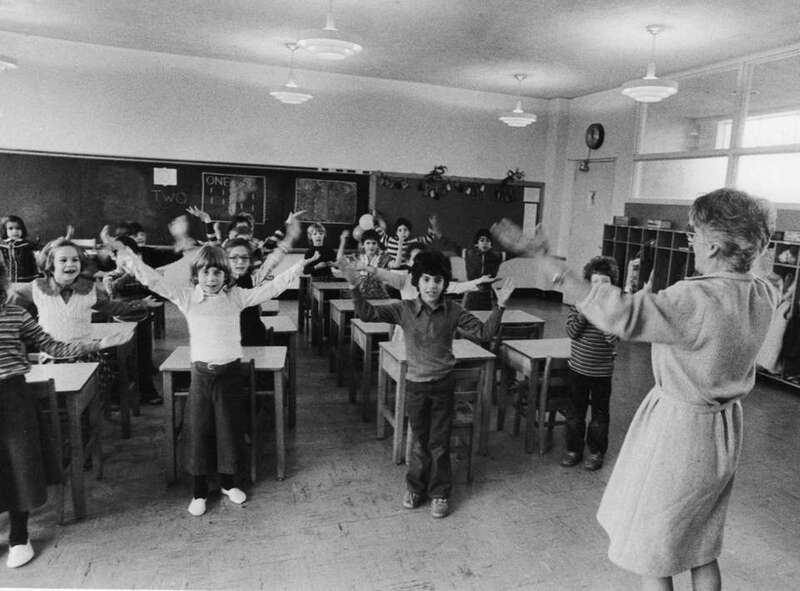 Above, a 1978 classroom shows first-graders in French class at the Waldorf School, a private school in Garden City. And in Amityville, local historian Seth Purdy said the racial imbalance remained after the schools were desegregated for this reason, too. "White parents would just send their kids to private schools," he said. More than a decade after Malverne schools were desegregated, the battle for busing for students who now had to travel further to get to school waged on. Residents in the Malverne School District voted down 10 consecutive budgets with funding for the busing of 400 black elementary school students. Malverne student Wendy Davidson was one of eight students named in a complaint filed by the Nassau County Chapter of the New York Civil Liberties Union complaint. After her 1.9-mile walk home from school, her mother Raquel said to a Newsday reporter in 1978, "sometimes she's so tired that she cannot even do her homework." Commissioner Allen ordered the school district to provide this busing on Aug. 9, 1978, just in time for the next school year. Eventually, New York state stepped in and agreed to fund the order. While acknowledging its tumultuous history, Malverne's current Superintendent James Hunderfund said he believes the district today has strong community support and pride in its accomplishments. "We just continue to, I think, go up that ladder that we're trying to climb," he said.